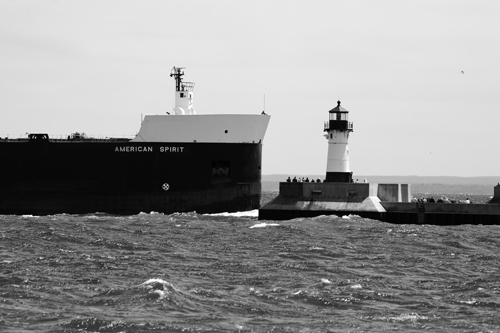 As you stand on shore watching the big boats (Lakers) enter the harbor in Duluth between the two long piers only 300 feet apart, it seems like they’re moving at a snail’s pace. However, once they get close, these Lakers are going faster than an average jogger and it’s “gangway.” And they better be going straight as there’s only a hundred feet to each pier on either side of them and there better not be anything in front of them. The people on the pier by the lighthouse and the single guy leaning off the bow of the boat gives you a sense of scale and how big these boats really are. I made this image with a Canon 5D camera and 70-200mm f4.0 “L” lens.